Some might say zip lining is for people who want to feel a thrill, but are too afraid to skydive or try a more ‘extreme’ sport right off the bat. I suppose maybe zip lining could be the ‘gateway drug’ of adventure sports, but it certainly doesn’t lessen the experience. Zip lines have their own unique draw – you can’t exactly sky dive through the trees of a forest for example. 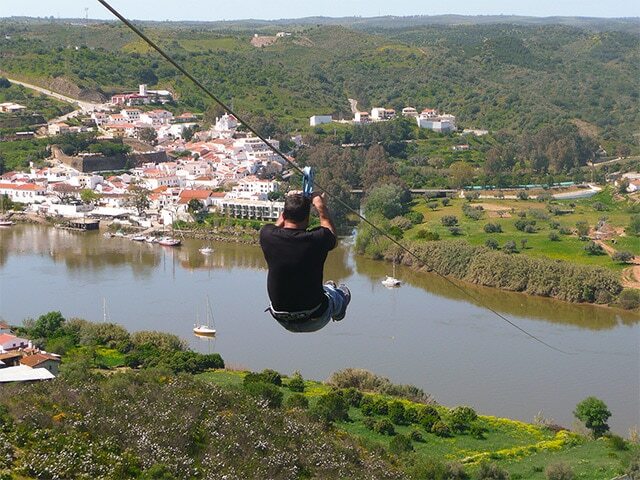 However, zip lines manipulate angles and gravity to can provide astonishing views, various speeds and close encounters with parts of the natural environment you wouldn’t normally be able to experience. From brushing past tree branches as you zoom through them, to moving from mountain to mountain, zip lining isn’t for the timid. While there are hundreds of zip lines all over the world for you to try your hand at, there are a few zip lines that stand out. 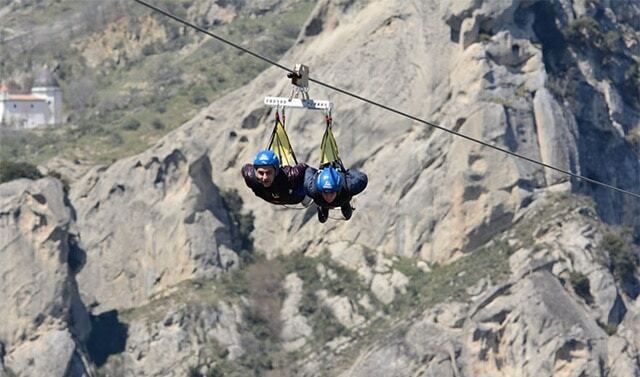 Let’s take a look at some of the coolest places to go zip lining around the world. What makes it so cool: One of the best parts of zip lining is being able to see nature from up above – getting the trees from a different angle, and flying through them creates a whole new, mind boggling experience. Even seeing the forests around your own home from above can be breath taking, but what about Costa Rica’s cloud forests? Even more so. Monteverde Extremo has 14 lines with the tallest standing at about 450 feet and many of the cables lasting over 1000 feet. This is sure to give you a great view of intense hills spotted with trees and shrubbery, but interspersed with clear grassy patches, and thin winding roads. Not only that, but you may even get to zip line through the foggy surreal clouds that line the trees, and if the conditions are right, even see a rainbow. You’ll feel like you’re in completely different world. Extra Perks: There is an option to add on a Tarzan swing or some bungee jumping, or even horseback riding. What makes it so cool: If you like the idea of zip lining through a jungle, why not try an urban jungle? Being the extravagant and exciting city that it is, Las Vegas has a few zip lines for you to try, but SlotZilla is the most appealing. 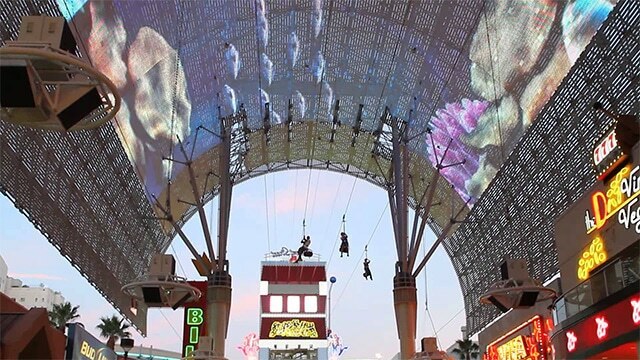 It has two different lines at different heights, and both take you under the canopy of The Fremont Experience (a 24 hour mall), which promises flashing lights, many people far below and pretty much the atmosphere you’d expect from Las Vegas. 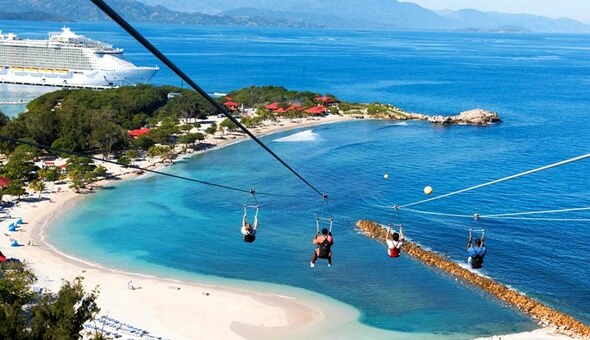 And you won’t have to strap yourself in a metal roller-coaster-like seat that some other zip lines utilize. I don’t know about you, but when I zip line, I want to feel free and relatively unrestrained. The higher line, starting at 114 feet, is 1,700 feet long, while the shorter is 77 feet high and 850 feet long. Why the difference? The shorter zip line is a bit slower, and takes the rider down in a seated position, while those who take the higher line go down in a superman position. Either way, you’ll be sure to get a unique view of this jungle’s night life. Extra Perks: Once you’re done you can walk around the Fremont mall, or of course, try your hand at a real slot machine in the Fremont casino. What makes it so cool: When it comes to zip lining, most people spend the majority of their time zooming through treetops, passing over rivers and enjoying the bird’s-eye view. Seeing things from a new perspective never gets old, but why not change the perspective? That’s exactly what Louisville Mega Cavern does. 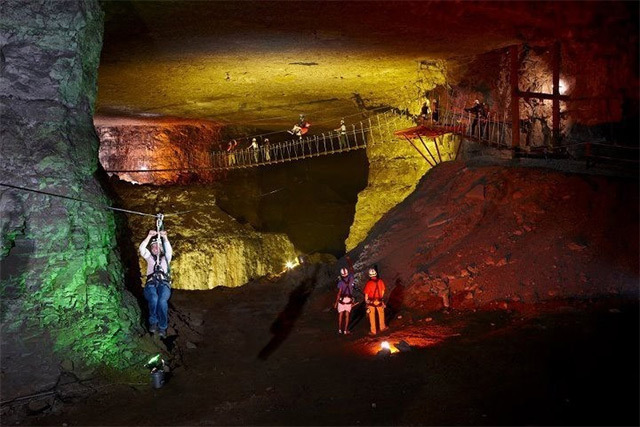 It takes zip lining to a whole new level, and one you wouldn’t expect – underground. 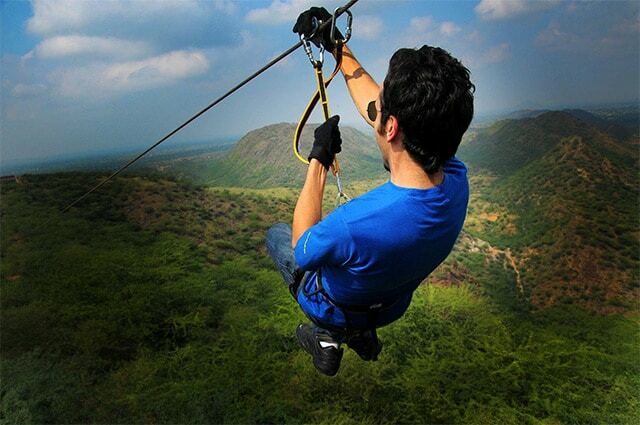 Mega Zips can boast that they are the one and only completely underground zip line – which is pretty hard to top. Their six lines go through 17 miles of tunnels. You’d never guess so much was going on under the city. The tunnels have an eerie feel, especially since instead of being out in the open, like most zip lines, you’re completely surrounded by stone, shadows and some neon lighting to add a bit of color into the mix. Extra Perks: You might come out knowing a little more about geology – the Mega Zip team likes to give a little background to the caves and formations. 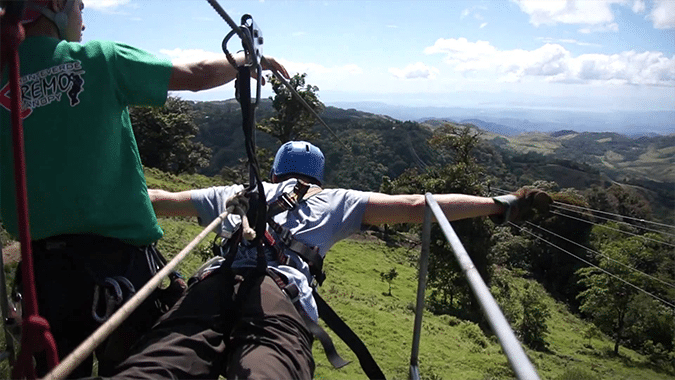 What makes it so cool: Santa Margarita has five zip lines that are conveniently located …. Right above a vineyard. I don’t know about you, but this sounds like a dream to me. Gliding down these lines, you’ll see an expansive view of the vineyard, surrounding hills, oak trees and greenery that you wouldn’t be able to get anywhere else. 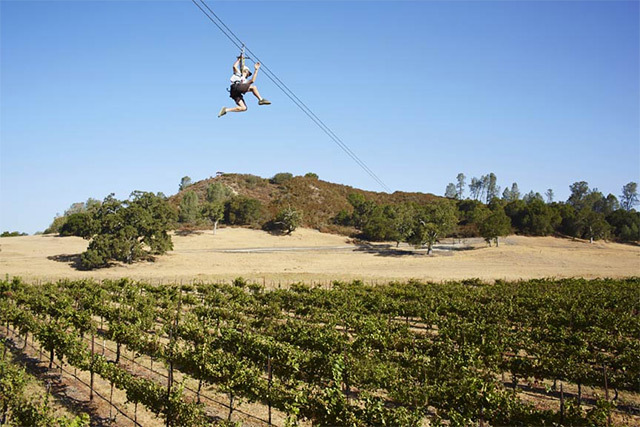 In total, the five zip lines offer a total 4,830 feet of zip line, giving you ample time, and varying heights and speeds, to properly view the 12,000 acre ranch and vineyards from every angle you could imagine. Not your average vineyard tour, if I do say so myself. Extra Perks: A tour of the vineyard (on foot this time), a history of the vineyard and surrounding area, how the vineyard and collection works and wine tasting, of course! Cost: There are various tour options, but the zip line tour with an optional wine tasting is currently listed at $99. What makes it so cool: This zip line is unique in that you descend from 500 feet right over the ocean onto the tip of an island. You might feel like you’ve left your body as you go down this wire, it’s such a surreal experience. From up high, all you can see are trees lining the island, the tip of the peninsula where you’ll return to, and blue – everywhere. The ocean and sky blend together, and create a sensation of endlessness. A truly zen experience, and one not many other zip lines can claim – this is one of the longest zip lines over a body of water. But when you jump off and start sailing down 2,600 feet of wire at 40 or 50 mph, it’s just pure exhilaration. At the end, you get so close to the waves crashing along the shore it seems as if your feet will touch them. Extra Perks: You get to practice on a smaller zip line first. Also, this part of the island is private to Royal Caribbean cruises, which could be a plus or a minus, depending how you look at it. What makes it so cool: Would you like to ride one of the world’s fastest zip lines while having the satisfaction of knowing you’re soaring between two mountains, about 3346 feet above the rolling hills that form a sharp contrast to the rocky and jagged edges of the mountain you’ve just pushed off of? The two zip lines that comprise Angel’s Flight give you some of the most spectacular views you could hope for combined with frighteningly fast speeds – the perfect combination for any nature lover and adventure sport enthusiast. On the lines, you rest in a superman position, so you’ll feel like one of the falcons that inhabit this region. The first line, called San Martino, starts in the small mountain town of Pietrapertosa and takes you about 4642 feet to another mountain town on the opposite side of the valley – Castelmezzano. Sounds like the perfect way to travel to me. Not to mention, it’s a lot faster than hiking – the first rope will take you up to 68 mph, while the second line, Peschiera, will take you right back to Pietrapertosa, but this time you could get up to 74 mph. Needless to say, this line isn’t for the faint of heart. Extra Perks: When you’re finished flying, you can enjoy more beautiful views of the countryside from Pietrapertosa and explore this quiet mountain town. What makes it so cool: If 74 mph isn’t fast enough for you, don’t worry, this line will take you to mind boggling speeds. Completed in 2013, Velocity is reportedly the fastest zip line in the world, and also one of the longest. The zip line is a mile long, but you’ll be done in a matter of seconds, because this line can get you going over 100mph. Yikes! The death defying speeds aren’t the only thing that make this zip line one of the coolest in the world. 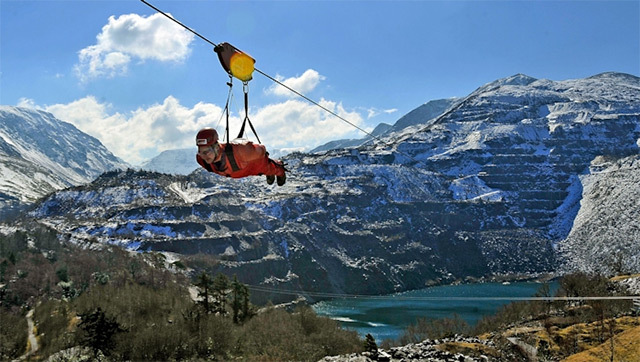 This zip line will take you above a slate quarry which also overlooks the rolling green hills of the countryside. As you hurtle down this one of a kind line, you’ll see the ledges cut into the sides of the quarry, the incredible work men have done to change the formation of the land, and a pool of icy blue water collected in the quarry. Extra Perks: As you make your way to the top, you’ll get a driven tour of the slate quarry, which used to be the biggest in the world, and find out some of its history. What makes it so cool: This zip line claims to be one of the tallest and steepest zip lines in the world – but that’s not the only draw. 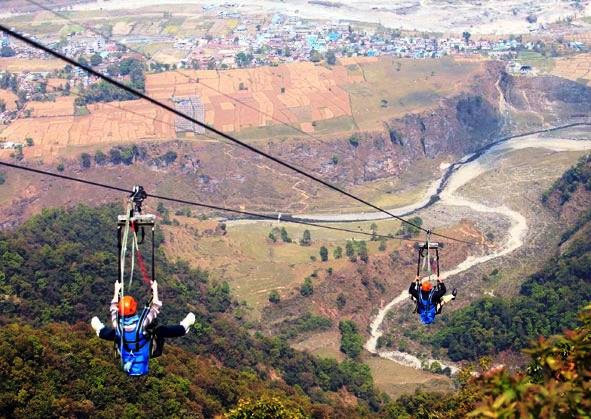 This zip line is situated right by the Himalayan Mountains, so as you ride down the 5905 feet of wire you’ll be able to see the slopes of the mountain, winding roads, small villages far below, a river and of course, the peaks of those majestic mountains. This is a really unique way to experience some of earth’s most impressive geography. Not to mention you can go up to 74 mph. Extra Perks: Later on you can trek around the area, or enjoy many of other adventure sports like rafting or paragliding. What makes it so cool: Yes, you read the location right – this zip line is one of the coolest in the world because it actually allows you to zip line between two different countries! So don’t forget your passport on this zip line. Not only that, but you’ll be zip lining right across a wide green-hued river, that stretches on and on into the distance. You’ll fly into Portugal at around 70 mph, gaining an hour of your life in the process (Portugal is an hour behind the time in Spain). This zip line might not boast the fastest speeds or longest line, but it is the only one that can take you back in time and to a different country, which is a pretty amazing feat in itself. What makes it so cool: This course, made of five wires, gives you panoramic views of the Aravelli Mountains that border the city, which you’ll have the pleasure to gaze down upon from your position on the wire, a 15th century fort, and the more rural areas surrounding the city. From up so high, it’s like looking down into a stadium, except in this case the stadium is made of mountains and grass, and the center is full of tiny buildings and people going about their daily lives. The 4101 feet of wire that make up this course will be a relaxing break from the hubbub of city life in India. Extra Perks: After zip lining, you can actually enter the old fortification, which has been transformed into a hotel. Cost: $35.38 per adult, $30.77 for children and students. All prices listed above current as of October 2015. This is a guest post by Lori Bell. Lori is currently traveling in Latin America and has been keeping busy with some adventure sports like white water rafting, climbing a volcano, and surfing.